Hey there, just saying a quick hello and thank you for this forum. New to owning a reptile and I look forward to scanning over posts and figuring out the best things I can do to care for my new cresty. I have some mammalian pets but I won't bug you with the details of those here. This is the house of Hastur, the king in yellow at least temporarily till he gets a bit larger and I move him to a larger house. So yeah, new reptile dad and welcoming of any tips you may have... currently a helicopter parent pouring over the temp and humidity levels to make him the happiest gecko he can be, but yeah. Welcome to GU and the world of geckos. Nice looking royal little guy. Feel free to ask questions. The most common question I find with new crested geckos is "my gecko won't eat". I don't think I saw my now 12 year old crestie Spencer eat (or notice any visible change in the level of the CGD) for at least a year. As long as the gecko is happy and growing (slowly is OK) try not to worry about it. Welcome! Love the name Hastur! Congrats on your new family member. Ask lots of questions, everybody here is helpful! Paper towel, and digital thermometer/hygrometer is great! One thing I notice about your tank, your gecko will be happier with more things to climb - vines and branches, ledges, etc. See if you can find a few things that you can use now and move with him into his next larger home when the time comes. Pet stores often have things both in the reptile and bird section that you can use for climbing apparatus, that aren't too expensive, and also check their clearance areas. Thrift stores are great places to find fake foliage and fun decor. Looking forward to hearing more about Hastur the king in yellow! Last edited by GeckoLeen; 11-04-2018 at 09:22 PM. Yeah I didn't want to clutter his cage too much at first but I plan on getting the lil guy a hammock when I find one. The paper towel is just at first, I want him to adjust to his new digs while I get the cage all nice and comfy for him and I was told a good way to know if he is adjusted (aside from the color change) is to see if he is poo-ing. If he eats, he poos and this is honestly the best way I can make sure its happening. After wards I have some coconut substrate and that lil critter keeper is holding an isopod colony =). Actually, for a crestie, the more cluttered it is, the better they like it. You are right about the paper towels. Best way to make sure he's eating and pooping. 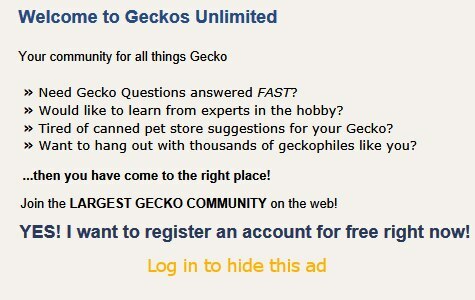 Welcome to Geckos Unlimited to you and Hastur as you begin your gecko journey. For additional ideas click here. Good foliage, and the moss will hold the humidity. I would add another vine or branch in the top part of the tank, so he can make full use of the space. You have your cork bark hide at the bottom yet, right? How is Hashtur doing? I bet he is happy in his new home. I hope he does, he was being a little skamp when I moved him in there had him out playing around and he was really trying hard to climb up on my face ><. He is in there I haven't seen him do too much yet but I'll check later tonight made sure he knew where his food ledge was and gave him some mashed up banana as a treat along with some wax worms. I plan on getting some more foliage and there is a second hammock if I ever get the time to fiddle with the suction cups I could add but he's grown quite a bit and seems to be doing well. Eventually I plan to put some plants on the bottom and I have a colony of isopods I'm trying to get to do there thing so I can add them to the tank as well.